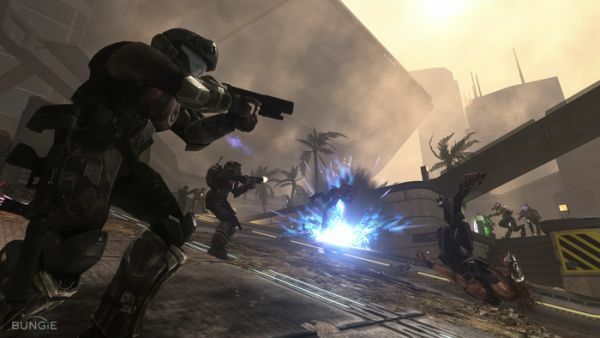 Bungie has unveiled a new map for Halo 3: ODST's four player co-op mode, Firefight. The map is called Rally Point and it looks to be smack dab in the middle of New Mombassa. Sector 10 inside the city of New Mombasa has seen better days. The air is heavy with acrid smoke parted only by the constant arrival of enemy drop ships. Lucky for you, the crossroads that converge on the entrance into ONI’s Alpha Site offer up a textbook choke point. The Covenant has come to claim access. You and your squad of ODST’s are going to stop them at all costs. You can see the new screens at Bungie's site, which also happens to promise a new Vidoc very soon. Also, don't forget to join us tomorrow night (August 20th) for Halo 3 co-op night!